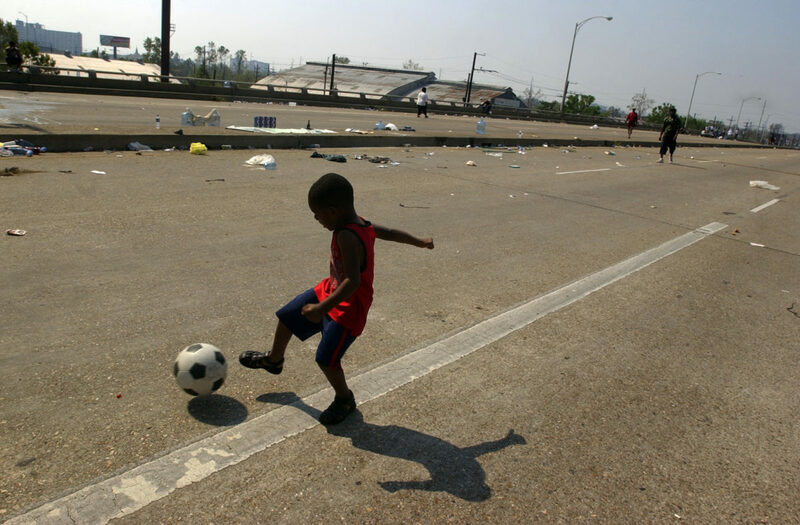 Rodney Lomax, 3, plays with a soccer ball on I-10 where he had been living with his grandmother, relatives and friends on September 2, 2005. His aunt told him he was camping. His grandmother commanded him to keep away away from the sides of the bridge. Five years later, when he was 8, he still remembered the flood and those days on the interstate. "The children kept us sane, because we had to be strong for them," said Rodney's grandmother and guardian, Rhonda Lomax. They eventually evacuated to California and lived with her uncle for several years. 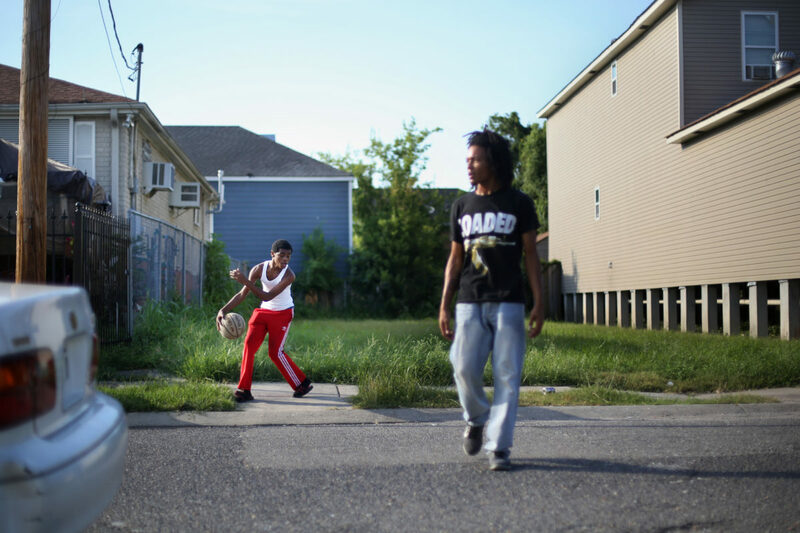 For months after Katrina, Rodney was terrified of water, even of being sprayed with a hose. The Christmas after the storm, he helped decorate a relative's office. The other children painted red and white, Christmas colors. Rodney painted the whole window black. "That's all I see," he told them. 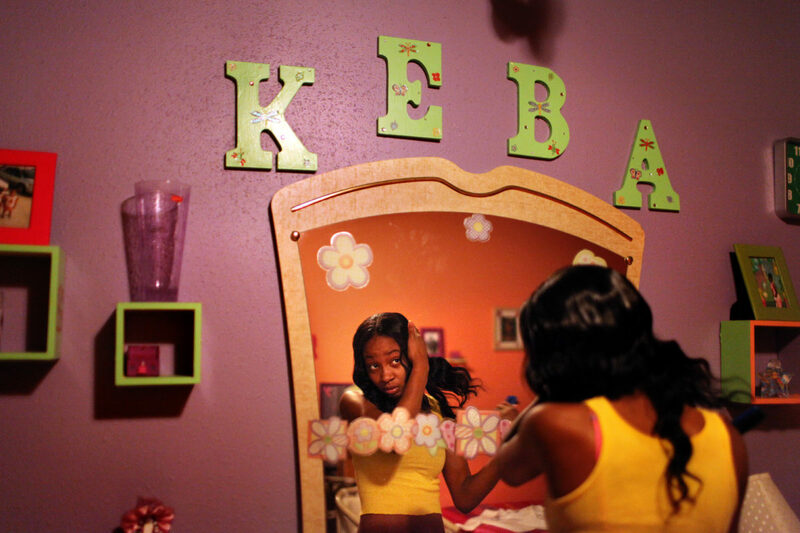 Yukeba "Keba" Collins, 15, gets ready for her first day of high school at her home in New Orleans in 2010. Their home had to be demolished and rebuilt from the flooding. Keba and her mother sought shelter across the street in a home that had a second floor. 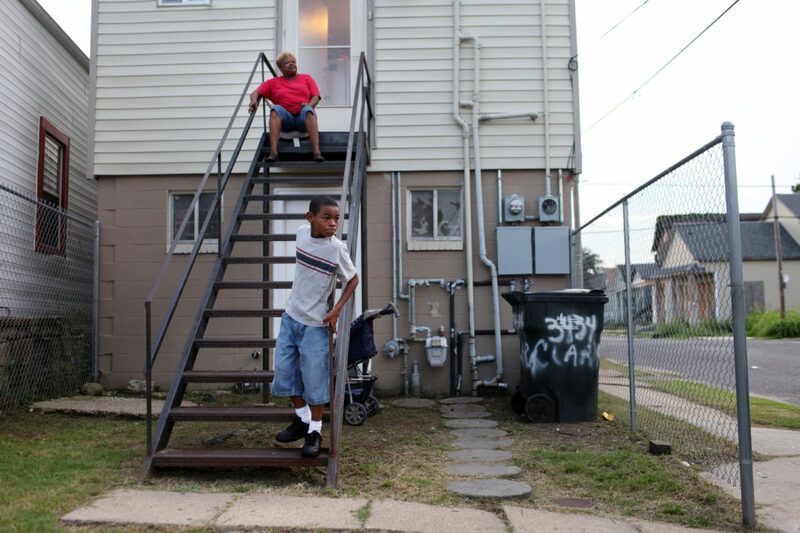 Rodney and his grandmother Rhonda Lomax hang out on the stairs leading up to their home in 2010. He and 32 people packed the second floor of his grandmother's duplex as the flood waters rose in 2005 when he was 3 years old. Two days later they were rescued by boat and transferred to I-10. They were then stranded for 5 days, waiting for help. Rodney Lomax, 8, gets his hair brushed by his grandmother before heading to school on August 20, 2010. Rhonda and Rodney have been inseparable since he was an infant. 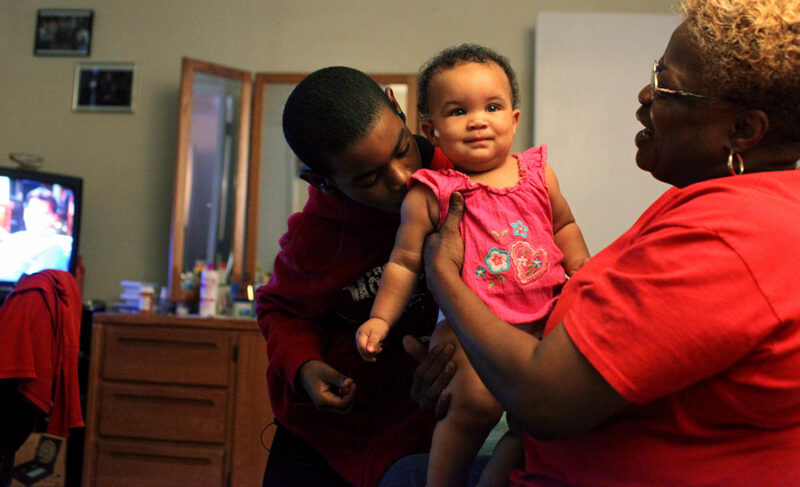 Rhonda gained custody of him early and despite her own health issues diabetes and sickle cell. 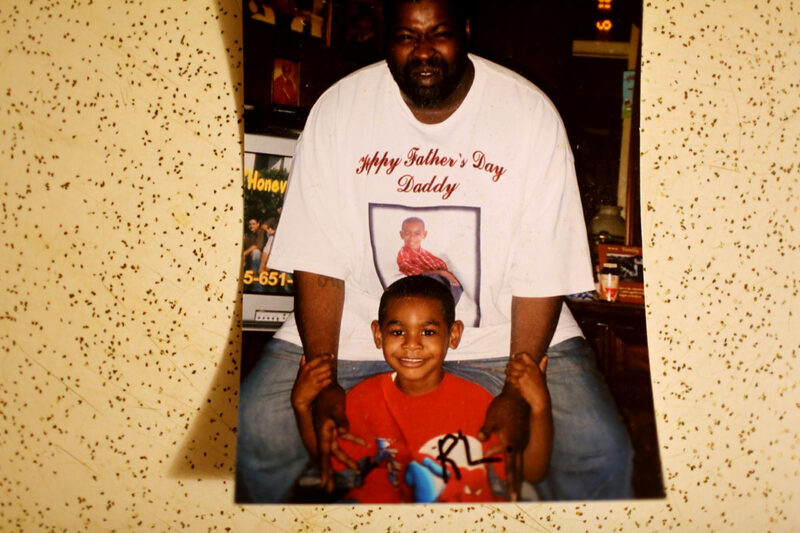 A photo of Rodney Lomax and his father, Rodney. Rodney has infrequent contact with his mother. And his father has been in and out of jail. "He has a good heart," Rodney says now. "He just makes bad choices." Rodney Lomax, 8, gets ready for school on August 20, 2010. Rodney Lomax, 8, attends school on August 20, 2010. Rodney Lomax, 8, kisses the shoulder of his cousin Brooklyn Jones, who is held by his grandmother Rhonda Lomax on August 19, 2010. 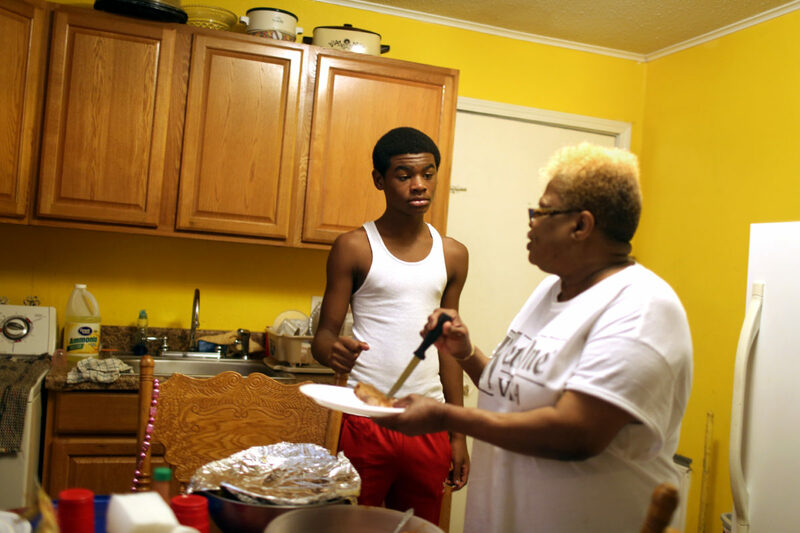 Ten years ago, when Rodney Lomax was three years old, a man in a boat rescued him and his relatives from the crowded second floor of his grandmother's home in Central City. Alice Fothergill, a sociologist at the University of Vermont and co-author of the book "Children of Katrina" paired up with Colorado State University sociologist Lori Peek to study the lives of hundreds of children following Katrina. Together, they found that the children who were in the city at the time of the storm experienced more profound symptoms of trauma than those who were able to get out with their families. And ultimately, the children's post-disaster trajectories tended to take one of three paths: declining, equilibrium or fluctuating. 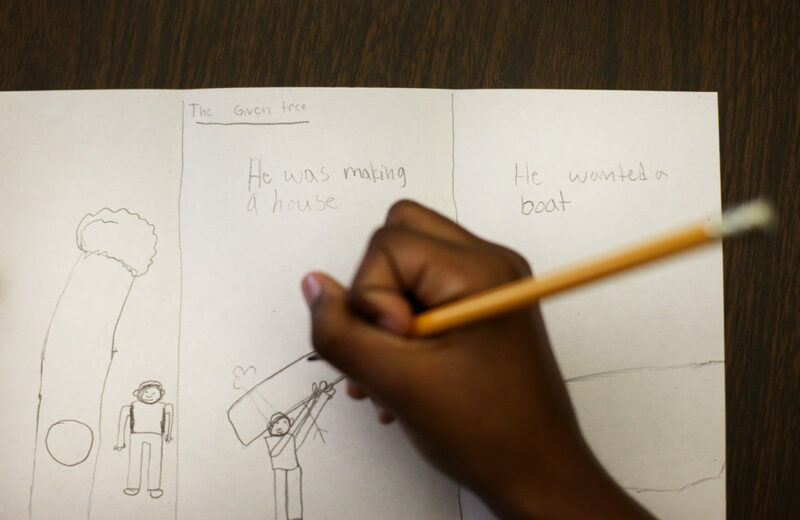 But the biggest key, said Fothergill, in these children's lives were having one or more anchor relationships -- grandmothers, aunts, uncles and others who provided support. 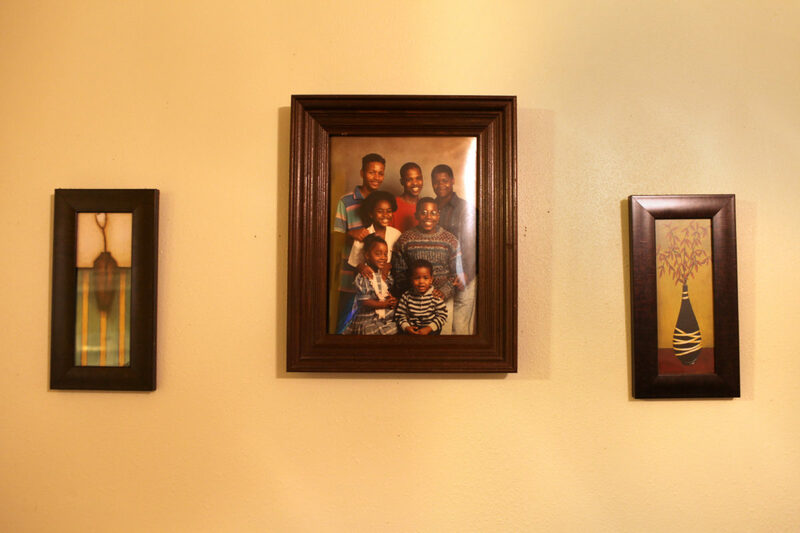 A family photo hangs on the wall of the home where Rodney lives with his grandmother. 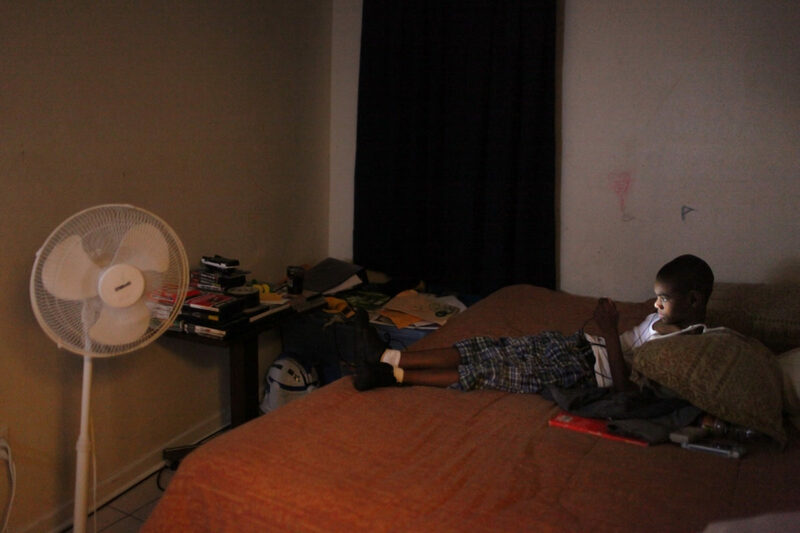 Rodney Lomax, 8, plays a game on his bed on August 22, 2010. Dr. Denise Shervington, a psychiatrist and president and CEO of the Institute of Women & Ethics Studies in New Orleans, said that because language is key to enabling children deal with traumatic experiences, these youngest storm victims were especially vulnerable in some cases. "Usually, at 2 or 3, a young person is not going to have the language memory and so their brains are not fully developed," Shervington said. "It's hard for them to use their language to talk about what happened to them ... You might be more impacted because you might not have the usual method of talking about trauma." Rhonda said young Rodney was fully verbal at the time of the flood. And though he says today that he doesn't remember the experience, he did speak up of the things he witnessed during the flood and subsequent evacuation, Rhonda said. 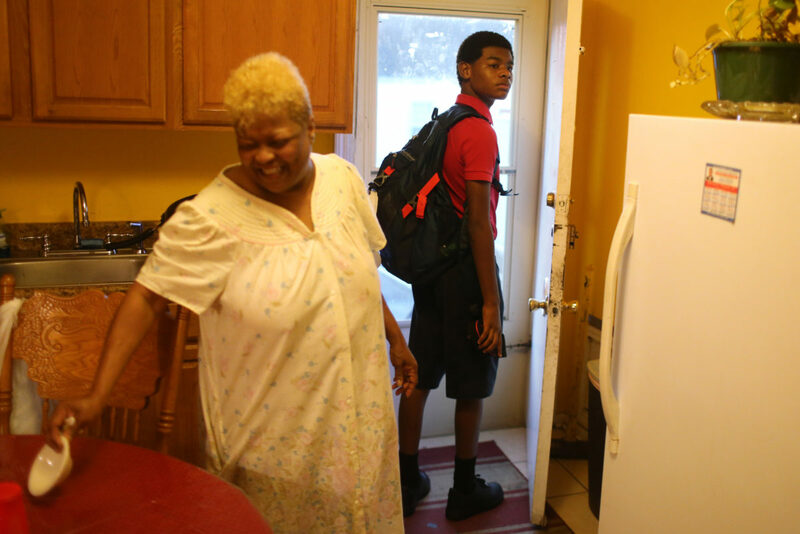 Rodney Lomax, 13, stands at the door as his grandmother Rhonda Lomax sees him off on his first day of 8th grade on August 11, 2015. 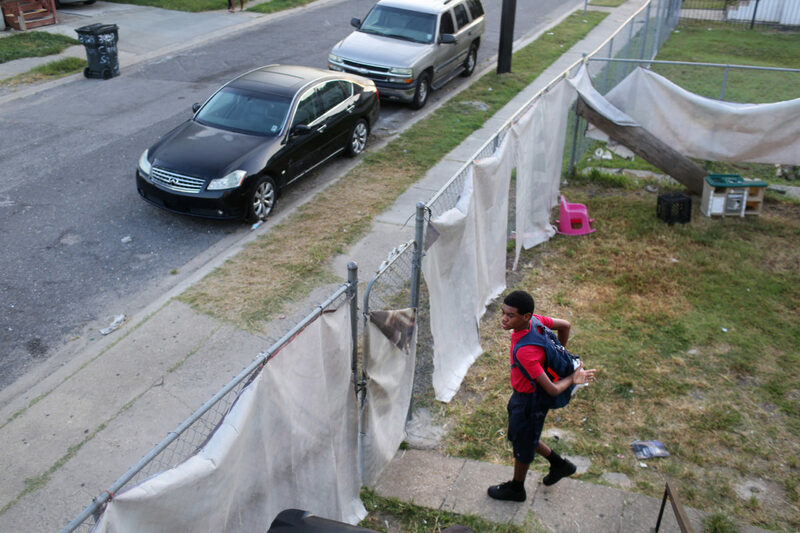 Rodney Lomax, 13, heads out for his first day 8th grade on August 11, 2015. 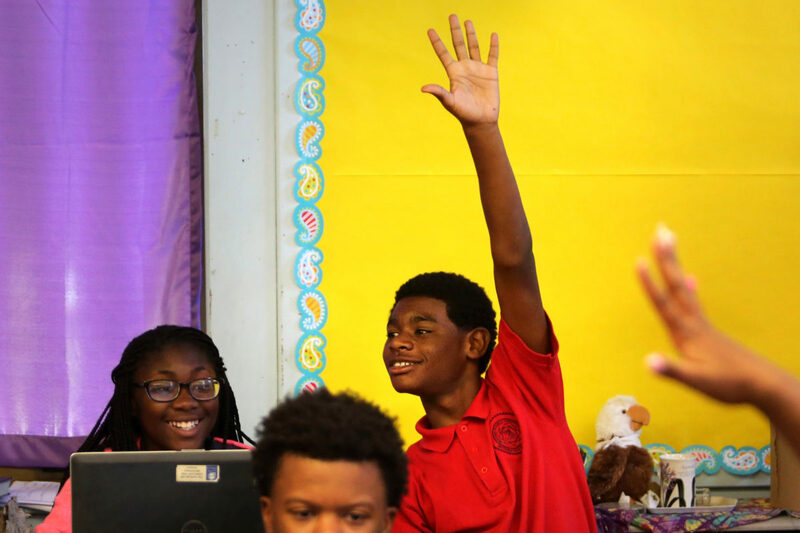 Rodney Lomax, 13, raises his hand during Jada Lundy's eighth-grade language arts class at Benjamin Franklin Elementary Mathematics and Science School on August 11, 2015. Rhonda said she's proud of her grandson and the gains he's made. She saw him begin to come out of his shell at school after a few years back in New Orleans, to relax and be himself. He still sees a therapist, but less frequently than he did 5 years back. "He's much better than he was," she said. "He was a heck of a mess at one time." But she still worries. Every now and then he has his moments, she says. He's moody or agitated. He lashes out verbally or raises his voice. "I don't know what brings it on," she says. 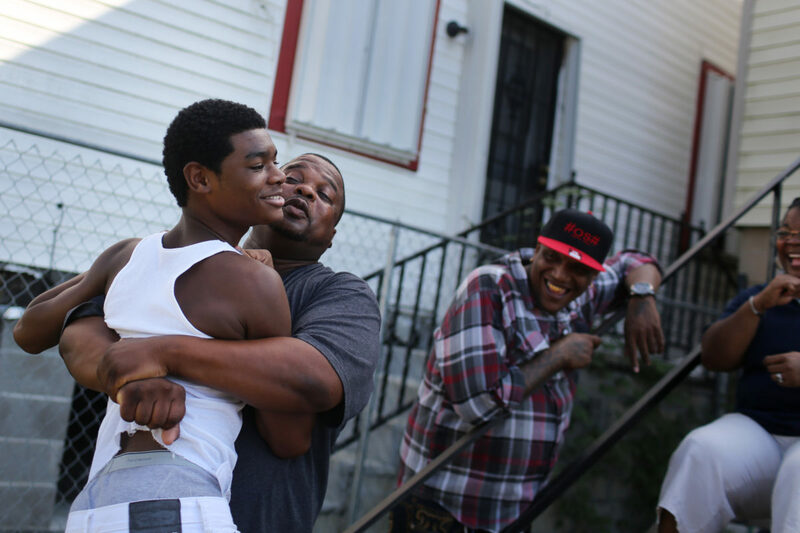 Robert Lomax helps himself to a big hug from his nephew Rodney Lomax, 13, during a birthday party for their cousin on August 2, 2015. Since he was an infant, his uncle Robert has provided a stabilizing force. Robert pops in many mornings before work to tell his nephew to have a good day. He attends his football games and gives him rides when he needs it. "Never had to spank him," Rhonda says. "All I had to do is call Robert. From the day he was born, his uncle loved him to death." 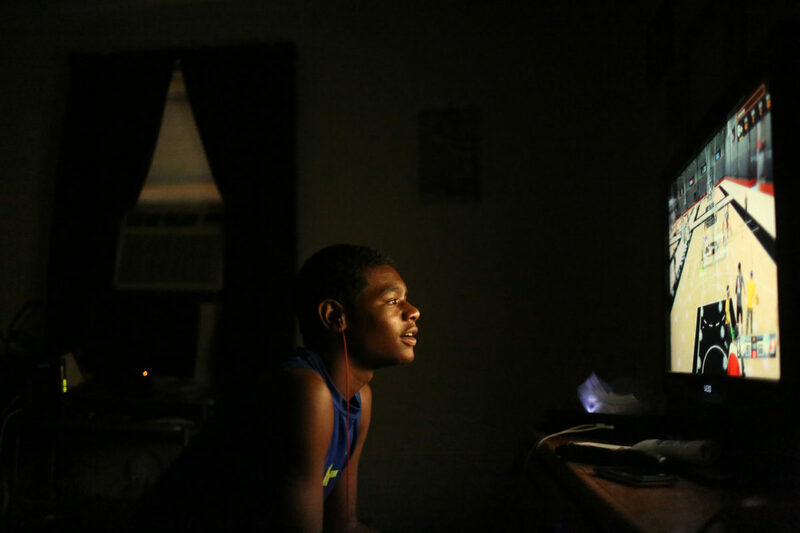 Rodney Lomax, 13, plays NBA2k15, an online video basketball game on August 13, 2015. Rodney now says he has no memory of Hurricane Katrina or that time on the bridge. He'd rather talk about the basketball video game he plays into the wee hours, and the videos he uploads to YouTube to show off his gaming skills. 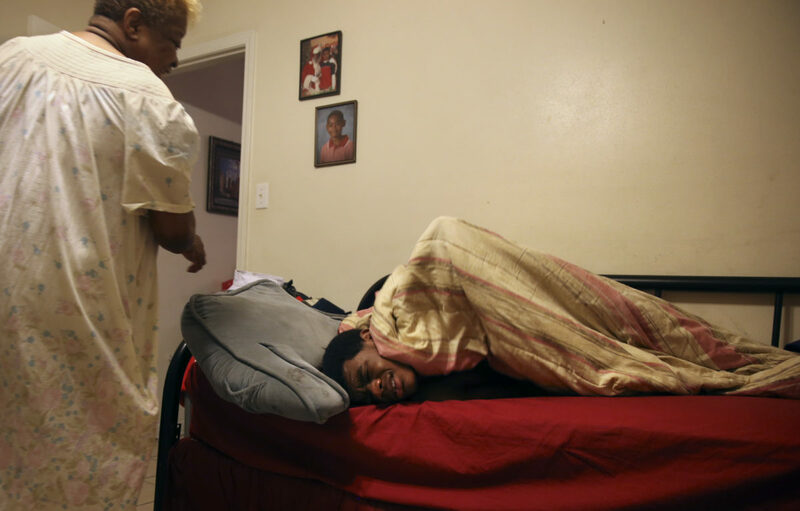 Rhonda Lomax attempts to wake her grandson Rodney Lomax, 13, on his first day of 8th grade on August 11, 2015. Rhonda serves Rodney a meal at their Central City home. 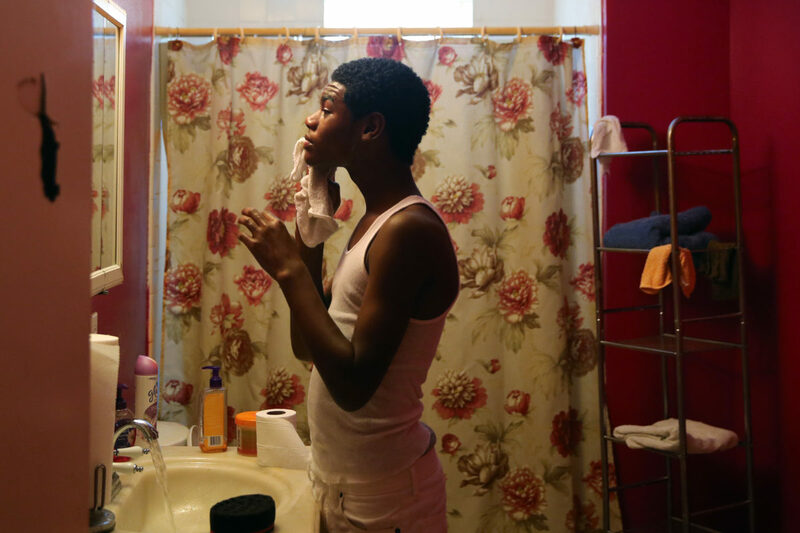 Rodney Lomax, 13, washes his face in the home where he lives with his grandmother on August 2, 2015. 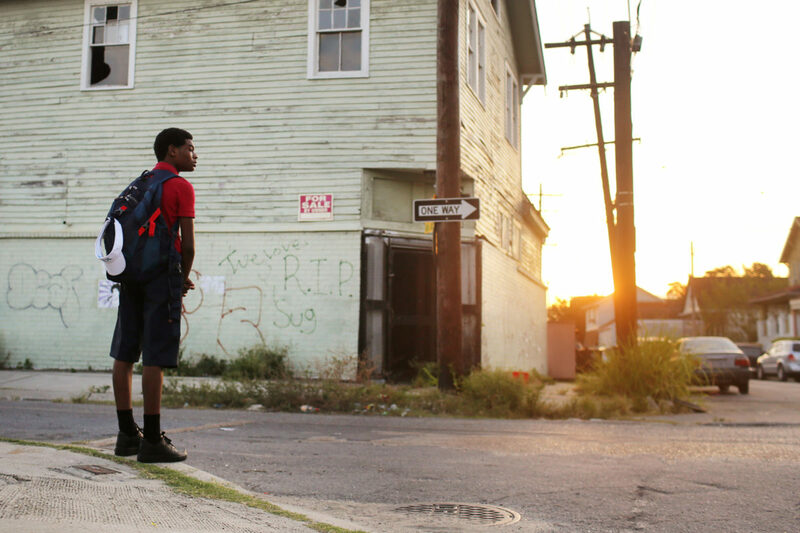 Rodney waits for the school bus across the street from a building that is tagged with graffiti reading "RIP Sug", a memorial to his father's cousin who was shot and killed there. Rhonda wants Rodney to graduate high school and to go to college. She wants to see him grow into a man who is comfortable sharing his concerns without letting them bottle up. She thinks his ongoing therapy is helping prepare him for a better emotional life. Rodney doesn't know what will happen after eighth grade. He wants to do well. He dreams of going to what he calls a "good high school." The emotional trauma of Hurricane Katrina took its toll. 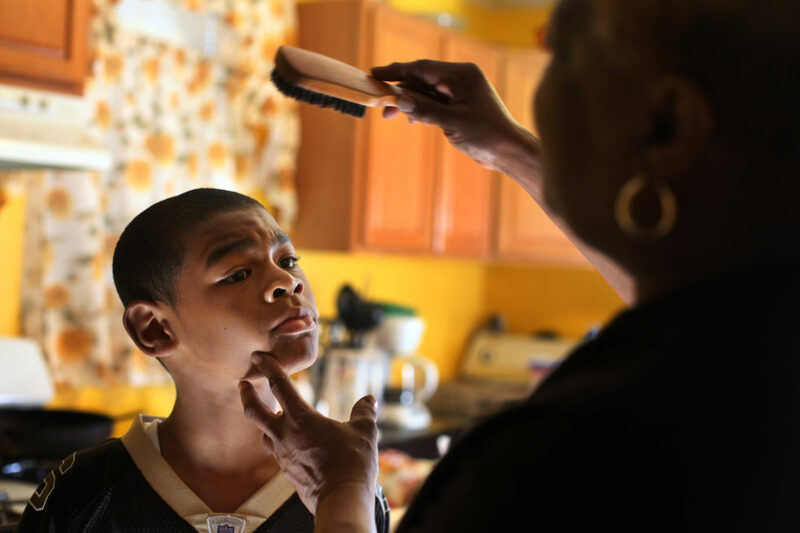 But life in New Orleans comes with a host of additional challenges for kids like Rodney Lomax. Interstate 10 near the Superdome resembled a scene from Haiti. People were desperate, hungry and thirsty. They needed their medication. Some were dying. The flood following Hurricane Katrina happened on Monday and this was Friday. Amid the chaos, Rodney Lomax, 3, kicked around socer ball with his friend. Five years later, at 8 years old, Rodney still recalled the days and nights he was stranded in New Orleans. “I remember it was a hot day, lots of people were dying and I saw the water coming. Then you saw many dead bodies and stuff. It was awful. The airplane came and got us and dropped down food.” By the time he was 13 in 2015, he said his memories are gone. His grandmother Rhonda, whom he calls “Mommy,” remembers the day near Christmas 2005 when she was sure she couldn’t ignore what seemed to be symptoms of post-traumatic stress disorder in her grandson. They had made it to California after Rhonda’s uncle tracked them down at an evacuation shelter in Pine Bluff, Ark., and bought them plane tickets so they could come live with him. But even with that safety, Rodney couldn’t leave his grandmother’s side without breaking down. He would follow her to the bathroom and sit outside the door while she showered. If she left to buy groceries, he would cry and seek assurances she would come back. “I couldn’t make a move without him,” she said. Rodney was invited to paint windows with his cousins for Christmas decorations. When all the other children grabbed bright colors, Rodney reached for black and filled the pane with darkness. “Everything he saw was black,” Rhonda remembers. “He said all he saw was darkness.” That year he began to see a therapist two or three times a week. In 2007, he returned to New Orleans with his grandmother. Compounding his exposure to trauma, his grandmother thinks, was the fact that months before the storm he walked out onto the stoop that leads to her second-story door and saw a cousin lying in the street, shot dead just near their home. Rhonda said she’s proud of her grandson and the gains he’s made. She saw him begin to come out of his shell at school after a few years back in New Orleans, to relax and be himself. But she still worries. Every now and then he has his moments, she says. He’s moody or agitated. She wants him to graduate high school and to go to college. She wants to see him grow into a man who is comfortable sharing his concerns without letting them bottle up. She thinks his ongoing therapy is helping prepare him for a better emotional life.